Knife magnets from a big box store wrangle needed tools and allow paint brushes to dry. Where do you find these magnetic strips? And everything sticks to them? You don't have to apply a magnet to the paint brush? Sure does, paint brushes especially......it's the absolute best way to dry them. The soup cans do have bigger magnets inside them because they kept rolling. Everything else stay put. mounting - how did you get the magnets mounted to the wall? They come that way.......with a mounting bracket. They are supposed to be for kitchen knives. Got these at IKEA or possibly Harbor Frieght and Tools. Did you put the cedar over the framing board. Did you insulate. - Would like to do this myself and my husband is too busy to help. I think I can do it by myself. I'm 5'5" 145 lbs. Can it be done? Any suggestions will cause warm and fuzzies. I'm obsessed wanting to do this. These metal strips are knife magnets, usually used in kitchens; here they hold tools and paintbrushes. Angus and Bolton will tackle building a back deck next. "We've got a how-to book from Home Depot and we're good to go," says Angus. They also hope to tackle the master bathroom this year. "It's so terrible that we only use it for storage," he says. We look forward to seeing the results. Soup cans. Remember wrapping a can in paper in kindergarten and giving it to your Mom as a pencil holder? Even though a 5-year-old could do it, it's a great idea. 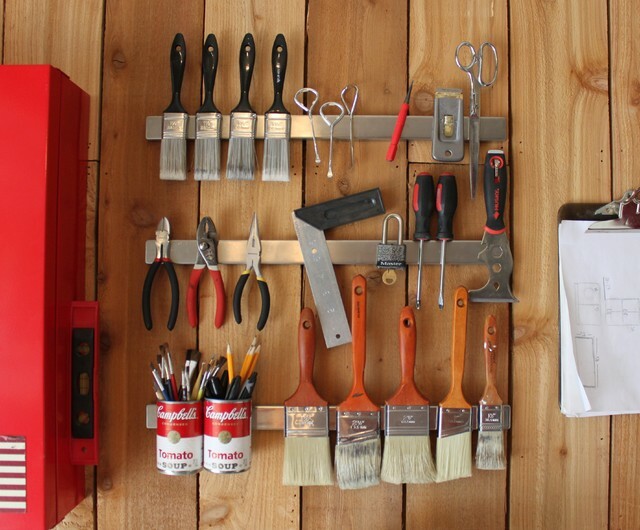 These cans are simply stuck to a magnetic strip to corral small tools, brushes and pencils. Leave the Campbell's labels on for a Warholian vibe, or strip them off for a sleeker look. Get magnetic. For small tools, consider using knife magnets. They beat searching through a drawer for what you need and are a better way to dry items like paintbrushes, Angus says. Reinvigorate your vents. Window vents and bathroom fans can easily get dusty too — and you don’t want them to be circulating fresh air mixed with dust. Avoid this by using a paintbrush to clean the vents. You might need to do a deeper clean if your fan has become noisy, as there could be dust inside the motor. After disconnecting the fan from the power supply, you can take off the cover and use cotton swabs to remove deep-seated dust. If the dust has begun to turn to greasy grime, use a damp cloth and an all-purpose or window cleaner to wipe the blades, then wash the cover well in soapy water. 8. Face Facts About DIYDIY delusion is a common ailment. Be realistic about your capabilities. “If I sanded that back and painted it and changed the knobs and shortened the legs, it would be just perfect,” you might say. But maybe you won’t. Maybe it will just sit in the garage because you realize you don’t have the skills — or tools — for the job. Unless you are handy at serious alterations, keep looking and practice patience until that ideal piece comes along.